For most of you, Bob Kueppers is someone whose influence (high) is inversely related to the likelihood you’ve heard of him. As Deputy CEO of Deloitte LLP, Bob Kueppers has responsibility for regulatory and public policy affairs. That means he rubs shoulders with government and industry leaders who determine regulatory and public policy matters in this country and the world. Bob Kueppers was recognized in 2009 by Directorship Magazine as one of the top 100 most influential professionals in corporate governance and the boardroom. Bob is refreshingly direct and candid in his interactions; combined with a mastery of a field both wide and deep, he’s a fascinating interview. Bob has a number of other additional roles at Deloitte, but we’ll focus mainly on his perspective on trust and regulation. CHG: Bob, I’m delighted to have you join this series. I hope you’ll forgive us delving into just two subsets of your expertise: trust and regulation. Let’s start with regulation. Regulators aren’t getting great press these days. Is it a necessary evil? Or does regulation play a more constructive role in our business and society? 3) When public health and safety are involved. Even true believers in free markets must acknowledge that a certain amount of regulation actually helps to preserve the credibility of the markets, which helps the market to operate and thrive. The debate over regulation often has to do with striking the right balance—finding the right degree of regulation. Like with “Goldilocks and the Three Bears,” it’s hard to get it “just right.” The appropriate degree of regulation often varies depending on the times, current events, and lessons learned. The formation of the Securities and Exchange Commission in the 1930s, following the crash and market abuses of the late 1920s, is often viewed as a regulatory success. The orderly functioning of the capital markets provided the financial fuel to fund the post World War II expansion that redefined America in the 1950s and 60s. When things go wrong, the natural reaction is to call for more regulation. But how can you tell when you’ve gone too far? For instance, critics say the recently enacted financial regulatory reform legislation, informally known as the Dodd-Frank Act, goes too far. Others claim it doesn’t go far enough. The truth is that we still don’t know the answer and likely won’t for several years—until the hundreds of regulations needed to make the reforms operational are written and implemented. CHG: What should be the role of regulation in the mixed economies we have today in the US and Western Europe? RJK: It depends on the priorities of the country in which that regulation operates. For instance, the US is often viewed as having a more litigious environment than other countries; as a result, our regulatory environment can be quite different than that of other countries. 2) Help to improve or maximize the quality and efficiency of the product or service through the establishment of standards and the related enforcement of those standards, such as through consequences for certain instances of non-compliance. Regarding regulation beyond our domestic borders: because there is no global government system, a truly global regulatory structure is unlikely in the foreseeable future. Differences among geographies in this increasingly global economy are inevitable. It’s natural for countries to want to reserve the right to do what they believe is in their best interest given the unique circumstances of their nation. Nonetheless, it’s important to recognize the inter-connectedness of our global markets—reinforced by the recent financial crisis. It’s helpful for regulators around the world to collaborate and work together—through forums, organizations, or otherwise—to achieve consistency in approach. We see such coordination in my profession through IFIAR, the International Forum of Independent Audit Regulators. Again, my own view is that regulation should serve to assist fair markets to operate because regulation helps foster trust in such markets by the market participants and the related stakeholders. CHG: Are there several key types or roles of regulation, which vary perhaps by industry? Or is the role of regulation universal and essentially the same, whether it’s the SEC, the FDA, the EPA, or the NHTSA? RJK: In theory, while the consequences of failures in regulation and poor execution by the regulated vary (ranging from mere inconvenience to potential loss of money, physical suffering, and health and safety consequences), the role of regulators is similar: to help to protect consumers and stakeholders and maximize quality and efficiency. In practice, there are differences. Think about regulation of an industry which produces goods or provides a goods-based service—like the airline or pharmaceutical industries, compared to the regulation of a profession, which generally covers standards of behavior or performance. What these disparate forms of regulation have in common, however, is that stakeholders operate with a level of confidence that compliance with regulation—whether by an airline adhering to safety standards or a public company audit firm following professional standards—builds confidence in the markets. CHG: Let’s hop over now to trust. What’s the relationship of trust to regulation? How does regulation help trust? Or is it a substitute for trust? Does the presence of one reduce, or enhance, the other? RJK: Regulation isn’t a substitute for trust, but the existence of regulation plays a key role in helping to build and maintain trust, particularly in times of crisis. Examples include the creation of the Public Company Accounting Oversight Board to directly regulate my profession following the Enron and Worldcom scandals, as well as what we are seeing now with financial services regulatory reform in response to the recent financial crisis. This suggests we could view a regulatory failure as one that doesn’t garner trust from the intended beneficiaries of the regulation. Such an outcome may indicate that there is a cost to society, without the concomitant benefit. Unfortunately, this seems to happen more often than we may realize. Our society goes through cycles of regulation and deregulation. But, regulation tends to be cumulative over time, and the result can be layers of regulation, not all of which may be effective. In some instances, conscious decisions are made to forgo regulation. Is that because a significant level of trust already exists or is it a perception about cost and benefit? Or, is it a combination of both? Having said that, regulation is a large part of what makes our markets the best in the world. It helped our markets recover well from the loss of investor confidence that followed the scandals that gave rise to Sarbanes-Oxley and is aiding in the recovery from the most recent financial crisis, though we still have a long way to go. Unfortunately, it’s really in times of crisis when the issues of regulation and trust are considered together the most. That’s when there’s pressure to act quickly, and hopefully strategically, to learn lessons and act on them. The answers under these circumstances may be different than what you’d get outside of a crisis environment. CHG: What do you find are the biggest misconceptions that businesspeople hold about regulators? Conversely, what misconceptions do regulators typically have about business? RJK: Businesses may perceive that the regulator has different objectives than the regulated. They may lose sight of the fact that as a regulated entity, they generally have shared objectives with the regulator. It is not implausible that regulated businesses may see compliance with regulation as an impediment to success in terms of competitive advantage or speed to market. Businesspeople are largely quite ethical and certainly want their products to be safe for consumers, for example. But at the same time, as a general matter, if you lose sight of the shared objectives and focus more on short-term success, rather than long-term sustainability of the business, you can become frustrated with regulations. Regarding the regulators, it’s important that they understand the trends and developments affecting the markets or industries they regulate. It can be counterproductive to develop changes in regulation without staying in close touch with the regulated entities and other stakeholders. This communication helps to inform issues like the cost of implementation, the need to modify proposed rules to make them more understandable, and unintended consequences of changes in the regulatory regime. There needs to be a level of trust between the regulator and the regulated to help prevent the regulator from implementing proposals that are unlikely to work in practice. CHG: The regulation model for the public company auditing profession is interesting in that there is government oversight, but the PCAOB is a private sector body. Why does this model work? RJK: The government, through the SEC, oversees the PCAOB, but in the Sarbanes-Oxley Act, Congress explicitly established the PCAOB as a private-sector body. The SEC’s oversight role was effectively reinforced by a recent Supreme Court decision in a case about the constitutionality of the PCAOB. The SEC oversees the PCAOB through the appointment of PCAOB members and supervision of the Board’s activities. This makes sense, given the public company auditing profession’s role in the capital marketsand the SEC’s overall mission to maintain fair, orderly, and efficient markets, as well as to facilitate capital formation while protecting the interests of the investing public. The main reason the model works is the alignment of the PCAOB’s mission with the regulatory mandate and statutory authority of the SEC. If there were substantive differences, it probably wouldn’t work as well as it does. This private-sector regulation working side by side with government regulation isn’t unique to the accounting profession. The Financial Industry Regulatory Authority is another example of a private-sector regulator that works closely with the SEC on issues important to the markets. CHG: Let’s forget about regulation for a moment and talk about another realm of trust—trust between professionals and their clients. It’s something you know a great deal about within your business. What’s the role of trust in client relationships? RJK: In general, trust and mutual respect form the foundation of the most effective client relationships. Those clients who understand our role and respect it are the clients with the best relationships. For example, clients who identify issues early in the audit, and auditors who are upfront with clients when they are not comfortable with an issue, tend to have the most effective relationships. A good client relationship doesn’t mean there are never any issues to resolve; to the contrary, it means that issues get resolved on a timely basis because they are identified early and there’s a mutual understanding of the need to work through a resolution process. Over time, greater trust fosters a stronger and more successful business relationship. When you’re a trusted professional advisor, you can be more effective in your own responsibilities. Let me be clear, this doesn’t mean we always agree with the client. To the contrary, we draw the line when necessary. Sophisticated clients—I don’t mean in terms of size and scale, but in terms of thinking and attitude—not only understand this, but appreciate it, even if it’s stressful at times. In the end, investors benefit from credible information. Auditing is unique, though; to do our job and fulfill our professional responsibilities, we strive to thoroughly understand the client’s industry, business, and current circumstances. This requires management and the audit committee to trust us. Yet we cannot take things at face value or trust without support; we must be professionally skeptical. Our independence and objectivity, coupled with our knowledge and experience, are key to the value that we bring as auditors and we don’t put those at jeopardy for any client relationship. 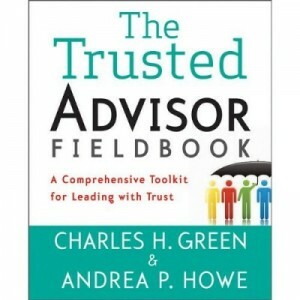 CHG: Are there a few key things that people in business can do to improve trust with their clients? · This one is obvious, but first and foremost, deliver high-quality services and bring the right resources to the assignment. · Facilitate open dialogue—the earlier, the better—if a problem looms. · Don’t be afraid to deliver the difficult news; in my experience, handling that candidly and proactively goes much further in building trust than delivering the good news or raising a problem at the last minute when deadlines loom. CHG: What about clients—not just in your service lines, but more broadly. What should they expect in terms of trust—and what should they be bringing to the party as well? RJK: I think it’s the same on both sides of the equation. Both service providers and clients should bring integrity, forthrightness, and strong ethical values to the table. This is especially true when it comes to auditing, but it holds true more broadly in other instances as well. Finally, it comes down to people. You could have a company with a great brand and corporate reputation, but if the management team lacks integrity, you do not want them as a client. I have worked in a partnership for over thirty years. One way I gauge people is to consider whether I would want them to be my partner. Would I trust them with our brand and our reputation? That’s the acid test for me. CHG: Bob, thank you so much for the gift of your time. Yours is a valuable and unusual perspective, and we appreciate your sharing it with us so forthrightly. Are You as Credible as You Think? Probably Not. Top Ten List of ways to improve the trust component credibility.